Microsoft’s ExBPA gets better and better. Furthermore, this Exchange Best Practice Analyzer is free. The purpose of the ExBPA Tool is to scrutinize your Exchange 2007 server with the thoroughness of a top consultant. Moreover, the ExBPA’s reports are unbiased and easy to read. What you get are details of how your configuration compares with Microsoft’s recommended best practices. 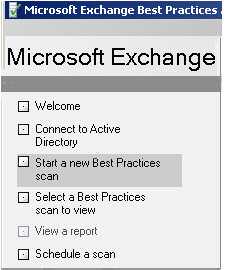 Exchange 2007 has a built-in version of ExBPA which uses .Net 2.0. However, it’s better to run ExBPA from a workstation such as XP or Windows 7. For this purpose you can download a free copy of ExBPA from Microsoft’s site and install it on a workstation. Watch out! The downloadable ExBPA.msi requires .Net Framework 1.1. It is likely that the next version of ExBPA will work with .Net 2.0. Click the Start orb, type ‘Programs and Features’ in the Search box, and select ‘Programs and Features’. Under Tasks, click ‘Turn Windows features on or off’. Expand Internet Information Services, and then expand World Wide Web Services. Click to select the Common Http Features check box, and then click OK. Installing could not be easier, just double click on the ExBPA.msi file. Once the install completes, and ExBPA launches, connect to the Active Directory responsible for your Exchange Organization. Naturally, ExBPA uses the credentials of the account under which you logged on. 1. A name for the scan. 2. Specify the scope (of your Exchange Organization). 3. Select the type of scan, e.g. Health, Baseline, or Readiness. 4. Check the network speed. The ExBPA displays six categories of information. Of most interest are the Best Practice and the Errors. I also like to skim the output for any warnings and non-default settings. The ExBPA makes a very good and comprehensive Health Check. If you remember to run a baseline check early in your Exchange 2007 career, it will pay back handsomely later when you run future scans. Talking of planning ahead, it’s always worth running the Exchange Server 2007 Readiness Check (see opposite). Verifying that the Schema Master is Windows 2003 SP1 (or later). Identifying any Active Directory domains which are not in native mode. Checking that the Exchange organization is in native mode. Identifying any Active Directory sites that do not have a Global Catalog server. The key to ExBPA is XML configuration files. In these XML files are WMI instructions for the very tests to be run on your Exchange server. At the heart of the Best Practice Analysis is a list of rules which establish whether results pass or fails Microsoft’s tests. ExBPA even checks automatically to see if there are any XML updates on the Microsoft web site. The ExBPA engine has a most descriptive name – the dispatcher. What the dispatcher does is send WMI collectors to gather the information. The ExBPA engine then analyzes the data against the configuration files, and generates the results on screen. One feature to lookout for is the ExBPA scheduler. This means that you can plan baseline scans to run at a time to suit you. Naturally, you would direct the output report to a file, since nobody is likely to be looking at the screen if the tests are run in the middle of the night. Error Message: ‘Common Language Runtime Debugging Services’. Work-around, uninstall ExBPA and .Net 1.1. Then reinstall! .Net 1.1 first, ExBPA. Control Panel –> Add or Remove Programs. Microsoft make plenty of money from Exchange, and these tools are their way of giving something back for free. The Exchange Management Console has a rich selection of built-in tools, for example, the Microsoft Exchange Troubleshooting Assistant (ExTRA). There is also the Exchange Performance Troubleshooter, which not only suggests the most likely cause any bottleneck, but also creates a check-list to cure the performance problem. Lastly, there are two more assistants, the Exchange Database Recovery Management, and the Exchange Database Troubleshooter. Best by name, best by nature, the ExBPA is a wonderful free Microsoft utility. One particularly good option is to run the Exchange 2007 Readiness test. The ExBPA is a real ‘techie’ tool, which not only makes your server more healthy and secure, but also makes it fun learning about how Exchange 2007 works.